being MVP: Playmobil PopStars! Stage + Giveaway & $500 Shopping Spree Contest! Playmobil PopStars! Stage + Giveaway & $500 Shopping Spree Contest! The PLAYMOBIL product, information and one gift pack has been provided by PLAYMOBIL. My kiddos love music and it is a treat to watch them shake their tush to the beats. Kenzie is at the stage where she loves to build so when I showed her the PopStars! Stage from Playmobil, she was anxious to get it out of the box. There are 70 pieces total which includes the stage, drum set, 2 standing microphones, one hand microphone, 2 guitars, 4 speakers, chair for the drummer, lights and a hat. It was pretty simple to put together and in no time, we were ready to rock. · This MP3-compatible set allows young pop stars to belt out their favorite lyrics, drum up awesome beats, and wow crowds with radical guitar solos. · Just hook up an MP3 player with the enclosed cable and choose your favorite chart topper. 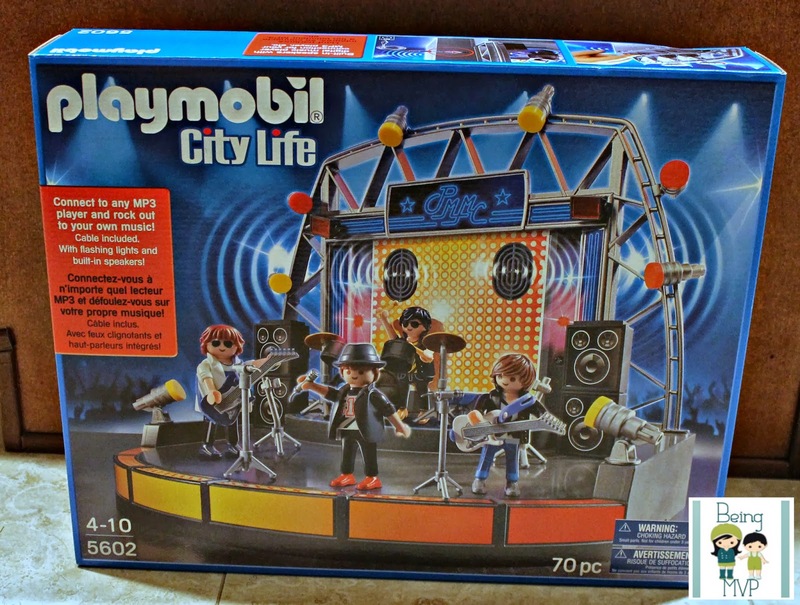 · The set includes four figures, stage with flashing lights, drum set, two guitars with guitar stands, microphones, two preloaded tunes, built-in speakers, and other accessories. Ready to rock on? PLAYMOBIL is launching an epic “Battle of the PLAYMOBIL PopStars!” contest where fans can vote for their favorite PLAYMOBILPopStars! group. After voting, participants can also submit an applause-worthy name for the band they voted for. Two contestants who submit names that really “rock” will be chosen to receive a $500 shopping spree on www.playmobil.us. The band is neat because there are two guitarists, one drummer and a singer. Kenzie likes to place a microphone in the guitarists hand and says he can do both. The pieces of the microphone stands and microphones themselves are pretty small so you will have to be cautious if you have younger children trying to play with their older siblings. Kenzie sets up her band and starts to push the buttons to light up the stage when Mason comes over to thrash the band mates. He absolutely loves listening to the band play music and dancing along. I have to supervise when they play together. The Playmobil PopStars! 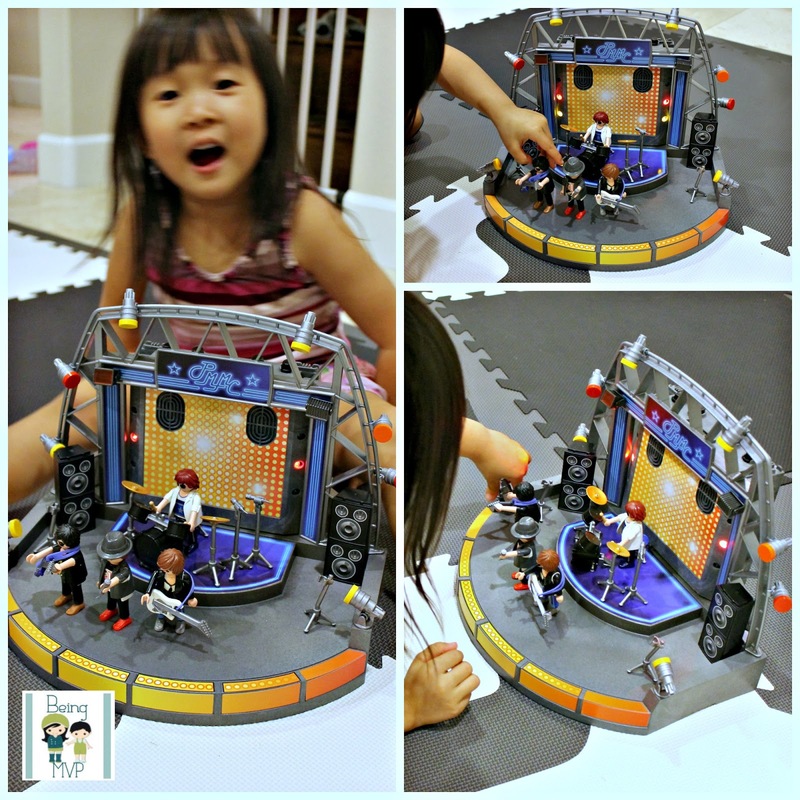 Stage is great for future superstars and music loving kiddos. Buy It: You can purchase the Playmobil PopStars! Stage for $39.99. Make sure to connect with Playmobil on Facebook and Twitter! I also like the Children's Pony Farm. I would like to have the Tactical unit copter, my son would love that. My daughter would love the Take Along Castle and my son would love the Western Fort! We'd also love the Volcano with Tyrannosaurus! I'd love to get the Great Dragon Castle for my grand son. My daughter would also like their 5142 princess fantasy castle. That would make an awesome Christmas present! The hotel collections is so unique and awesome! I love the entire Princess Fantasy Castle line! Item Number: 5951. Thanks for the chance to win! If money was no object I would scoop up all the items in their Pirate line. My son is into pirates at the momen. I would also like the Take Along Modern Doll House. My girls would love to play with anything from the Zoo from the City line collection. Playmobil is very popular in my house. Love the quality and the opportunity for endless imaginative play. I like the 1-2-3 take along fire station! Thanks so much for the fantastic giveaway! I also want the Take Along Castle! My son would love the Dinos set with the volcano and T-rex! I like the Children's Pony Wagon. We would like to also have the Falcon Knights´ Battering Ram. Pirates! My son has been collecting the Playmobil pirates since he could walk. We lived in Germany and he LOVED everything PLAYMOBIL!! I like the children's pony farm for my kids. I like the Princess toy set. I used to have a wedding set that went great with my brother's pirate set. So much fun to play with! I want the Summer Fun Large Furnished Hotel. My daughter would love it! I also like the Dragon Castle.